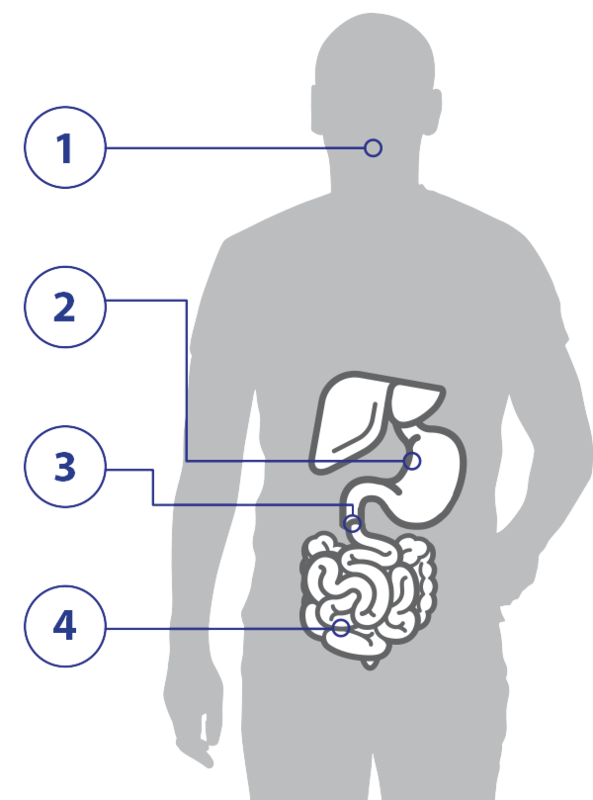 Enzymes are biological catalysts that are essential for the breakdown of proteins, fats, and carbohydrates into smaller pieces in order to facilitate absorption by the body. 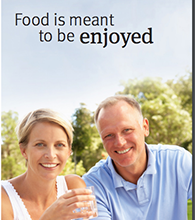 Enzymes are essential for healthy digestion. We offer a wide range of enzymes. Setting quality standards for the industry, we test each batch of product for enzyme activity. We use methodologies published from both the Food Chemical Codex (FCC) and United States Pharmacopeia (USP), a compendium of standards used internationally for establishing the quality and purity of ingredients. Each of our manufacturing facilities is state of the art with enhanced environmental controls. 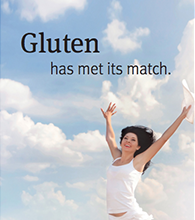 Our enzymes are processed under special conditions so that the delicate enzyme constituents remain intact. 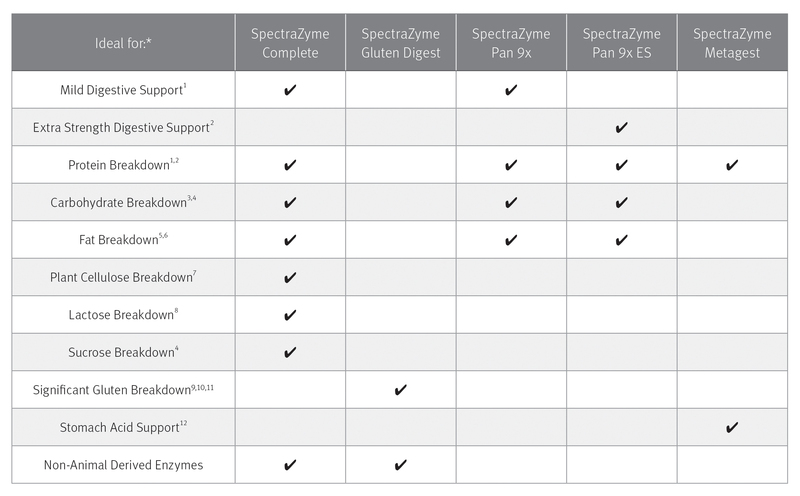 SpectraZyme enzymes contain ingredients that have been tested in laboratory and clinical studies. Omogbenigun FO, Nyachoti CM, Slominski BA. J Anim Sci. 2004;82(4):1053-1061. Bragelmann R, Armbrecht U, Rosemeyer D, Schneider B, Zilly W, Stockbrugger RW. Eur J Gastroenterol Hepatol. 1999;11(3):231-237. Siivaramakrishnan S, Gangadharan D, Nampoothiri K, Soccol CR, Pandey A. J Sci Ind Res. 2007;66:621-626. Jonsson KA, Bodemar G. Hepatogastroenterology. 1990;37:217-222. Delhaye M, Meuris S, Gohimont AC, Buedts K, Cremer M. Eur J Gastroenterol Hepatol. 1996;8:699-703. Opekun AR, Sutton FM, Graham DY. Aliment Pharmacol Ther. 1997;11:981-986. Thomson Healthcare. Available at: www.pdrhealth.com/drug_info/nmdrugprofiles/nutsupdrugs/sup_0328.shtml. Accessed November 20, 2014. Sanders SW, Tolman KG, Reitberg DP. Clin Pharm. 1992;11:533-538. Stepniak D, et al. Am J Physiol Gastrointest Liver Physiol. 2006;291:G621-G629. Mitea C, et al. Gut. 2008;57:25-32. Salden B, et al. Gastroenterology. 2014;146(5):S-545 (abstract). Dev Bardhan K, Strugala V, Dettmar PW. Int J Otolaryngol. 2012;2012:646901.